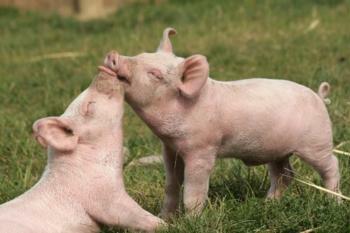 Pigs are some of the smartest animals on Earth. Highly social, intelligent, and curious, they engage in complex tasks, form elaborate, cooperative social groups and feel fear, pain, and stress. Studies show that they are more intelligent than dogs, and scientists have demonstrated that pigs are capable of playing simple video games, learning from each other, and even learning names. Most breeding pigs in the U.S. are confined in “gestation crates” for virtually their entire lives. For several years, they’re confined to crates that nearly immobilize them, enduring a cycle of repeated impregnation. These individual cages are approximately 2 feet wide — so small the animals can’t even turn around or take more than a step forward or backward. Due to the duration and severity of their confinement, these pigs’ suffering is among the worst of all factory-farmed animals. Following The Humane Society of the United States’ legal complaints to the Federal Trade Commission and Securities and Exchange Commission over false and misleading animal welfare statements made by Seaboard Foods, the nation’s third-largest pork producer, Seaboard has been forced to alter its online advertising around the hot-button topic of animal welfare throughout its operations. Unfortunately, the company continues to use inhumane animal care practices at its farms, such as the extreme confinement of breeding pigs in small gestation crates. The complaints followed a 2011 HSUS undercover investigation that documented inhumane treatment of animals at a Seaboard facility. The investigation revealed pigs confined in tight gestation crates barely larger than their own bodies, preventing them from even turning around, and workers hitting animals, duct-taping their legs to their bodies and jabbing their eyes. Seaboard’s lofty claims about animal care were in stark contrast to the findings in the investigation. Seaboard had claimed that the company uses “the most humane practices throughout the animal’s life…” In response to an FTC investigation triggered by the HSUS’ complaint, the company removed this false and misleading statement about its commitment to animal care.